Fred Phelps died this week. His passing made news, but didn’t generate many tears. Phelps was a civil rights attorney until he was stripped of his license in 1979 by the Kansas Supreme Court for alleged ethics violations. Phelps considered the court system corrupt, and saw the disbarment as a badge of honor. It was his other life, anyway, that would bring him notoriety, if not respect. In 1955, before he got his law license, he had founded a church in Topeka: Westboro Baptist Church. And it was as pastor of Westboro Baptist that he made his mark in the world. The small church, made up mostly of Phelps’ extended family, always served as a platform for his brand of, well, deviant is probably not too strong a word to describe his theology. Phelps, an extreme Calvinist, believed that a person’s eternal destiny was sealed the moment they were born. Warning the condemned would not save them, but it was essential for Phelps’ and his church’s own salvation. So they “evangelized,” not by proclaiming the love of God, but his hate. God hates all evil, went the gospel according to Phelps, and all who were evil. It was in the nineties that homosexuals became the main target of Phelps’ God’s hatred. 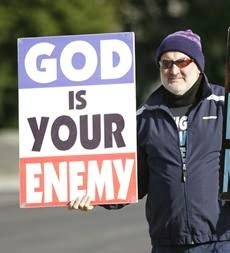 That was when Westboro began picketing funerals, holding up signs and chanting about God’s hatred for people like Matthew Shepherd, a gay Wyoming student who was beaten to death in 1998, and later of AIDS victims and even soldiers, whose deaths Phelps said were punishment from God on a nation that allowed sin to thrive. The demonstrations at military funerals, in particular, aroused counter-demonstrations to shield mourners from the Westboro contingent, and even brought about laws in 40 states restricting demonstration at funerals. In later years, Phelps was apparently excommunicated from the church he planted. If so, I suppose it’s to be expected; a church so preoccupied with what God hates would understandably have a hard time figuring out how to love each other. Let me be clear here: Fred Phelps was wrong. He was wrong that God can be accurately described in terms of what and who he hates. In fact, it’s an unusual thing in the Bible to find references to God hating at all. The vast majority of those texts talk about God’s hatred of certain acts - almost always injustice or abuse of the weak by the powerful. A very few passages refer to God hating the wicked or unrighteous; I suppose those are the passages that Fred Phelps lived in. I think, though, that those are best explained as hyperbole that highlights God’s love for those who do right, in the same vein as “Jacob I have loved, but Esau I have hated,” or Jesus’ demand that someone who follows him must hate their family. Much more frequent are passages that talk about God’s love, his compassion, his grace, his slowness to anger. All the “smiting” aside, in the Jewish scriptures God is described at least nine times, in a kind of confessional formula, as “compassionate and gracious, slow to anger, and rich in love and faithfulness.” John reminds us of God’s great love for the world in giving his Son. Paul marveled that God’s grace was offered to him, “the worst of sinners.” Jesus associated with “sinners” to such a degree that respectable people criticized him for being just a little too friendly with the gritty underbelly of his world. Phelps’ preoccupation with God’s hate for people came, not from the Bible, as he would have had us believe, but from his own mind. Must have been terrible for those who were the recipients of his animosity, and for their families. But it must have been terrible for Phelps, too, to live with all that hatred. That, I think, was where Fred Phelps sat - in the chair of that Pharisee, bewildered by love because he knew only judgment, distrusting grace because he had never let himself admit his need for it. And, I think, as believers in that grace, we have to remember that it extends all around the table. To sinners discovering the joy of a new life, yes, but also to hardened, angry pastors who don’t know how to love anyone, even the Lord. If you believe Jesus, the only way folks like that will learn to love is if those who know God’s grace extend it to them. It doesn’t really matter what you think of Fred Phelps now. He’s gone. But there are lots of people out there, on both sides of the church doors, who need to know of God’s love. On the one side are those who think God hates them, and they need to see that he doesn’t. On the other side are those who are convinced God hates everyone else. What both sides need is grace made flesh in the actions and words of those who have experienced it first-hand. Then maybe no one else will have to live with the lie that God hates.